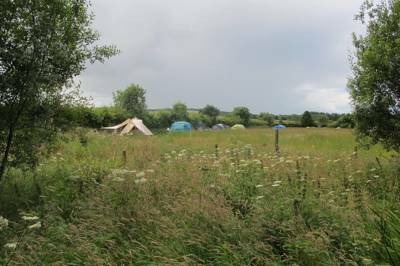 Glamping and camping in five gorgeous acres of wild flower meadow in Eastern Scotland. Loch-side sleeping and steamship exploring in one of Loch Lomond & The Trossachs National Park's most historic locations. 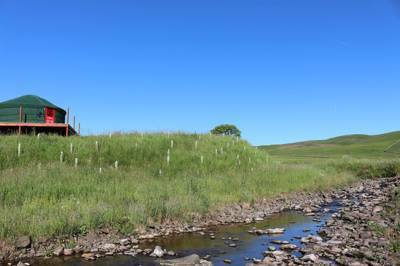 Stunningly located waterside yurts in a secluded valley on the Scottish borders, just an hour and half from Edinburgh. With grounds that extend to a whopping 400-acres, there’s plenty of room around 15th-century Dundas Castle for visitors to camp like kings. And on the outskirts of historic Edinburgh, there are few better places to do it. Regardless of the grand L-shaped castle, the countryside here is spectacular and even the building’s name alludes to it – dùn deas is Gaelic for 'pretty hill'. The land around shifts from mown, manicured lawns into flanks of mature trees and broad meadows stretching into the distance. Behind it all, though out of view, is Edinburgh itself, less than 30-minutes away in the car. The kingly camping in question comes in the form of five glamping tents positioned on their own wooded knoll away from the main castle building. The folks at Glampotel like to describe them as ‘canvas cottages’, with luxury double beds inside and extra camp beds set up for families. 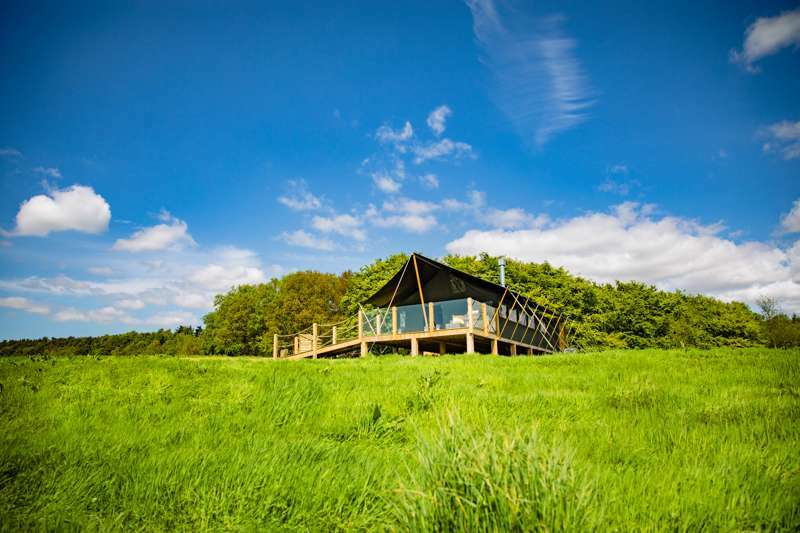 Together they create a self-contained glamping glade with everything you need – including en-suite bathrooms with towels and toiletries provided and a separate kitchen unit for cooking up a storm. Their position, with excellent views of the castle’s private loch, provides a wonderful sense of privacy and seclusion, while evenings are particularly pleasant. When the weather’s good, the trees cast long, slim shadows across the grass and you can sit out using the BBQ on the front deck of the tent. When it’s cold there’s a toasty log-burning stove inside. The interior of the castle itself isn’t open for tours, but guests are welcome to explore the expansive grounds. A statue of Oliver Cromwell still stands out front, built in recognition of his stay in the castle during the Battle of Dunbar in 1650, while guests with a former-life as a couch potato may recognise certain spots around the castle from it’s many TV and film cameos. By day you can tour the Royal Mile and by night you can kip like a canvas cottage king. Canvas cottages are each appointed with king-size beds, wooden floors, bespoke wooden furniture and all the equipment you need in your kitchen unit, including a cool box. Towels and toiletries are provided. There's also a lockable chest, solar lights with USB outlets for charging your devices, and candles for your lanterns. A wood-burning stove brings a toasty glow and the first box of wood is free. Outside, your own private deck is complete with gas BBQ. Cottages have their own outdoor ensuite bathroom with hot shower and composting toilet. It's not far to the nearest golf course (07787 260190) – there's one on the castle grounds with visitors able to play for £18 (or £15 for 9 holes). Climb Arthur's Seat (0131 652 8150), stroll down the Royal Mile and visit Edinburgh Castle (0131 225 9846). The city is also famous for it's festivals, of course, so it's always worth checking out whats on during the time of your visit. The Edinburgh Festival (0131 473 2099) through August and its Festival Fringe (0131 226 0026), the Military Tattoo(0131 225 1188), Hogmanay (0844 573 8455), the Jazz and Blues Festival (0131 473 2000) and the International Book Festival (0131 718 5666) are particular highlights. There's no restaurant in the castle but the bucket load of cooking facilities makes preparing your own food easy (particularly the BBQ on your deck). Edinburgh, of course, has endless choice. Dundas Castle is situated near South Queensferry, approximately half an hour by car west of the centre of Edinburgh and just south of the Forth Road Bridge. Guests should enter by the main gates of the estate leading from the B800 which runs between South Queensferry and Kirkliston. Note that the Dundas Castle postcode is not recognised by GPS but by entering EH30 9SS you will be directed to the B800 where you will see the sign for the front entrance to Dundas Castle. 5 canvas cottages on a wooded knoll. 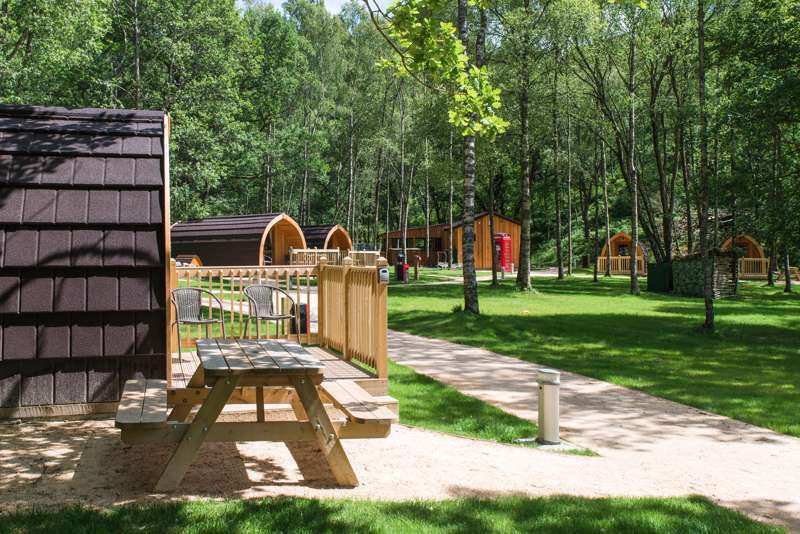 Each sleeps up to 2 adults and 2 children on a double bed with additional camp beds for kids provided.